This time of the year, all across the country, hospitals are creating scorecards of quality metrics for the upcoming year. But what are the economics of those quality metric choices? It turns out each metric has very different financial implications for the hospital and so there are some metrics that are more cost-effective to achieve than others. Most hospitals focus on hospital-acquired conditions and build their quality goals around reducing these conditions. Last November, the Agency for Healthcare Research and Quality (AHRQ) published an analysis of the cost of common hospital-acquired conditions. When you study the literature on these costs, you’ll find that there is an enormous range of estimates for each condition in different studies and journal articles. The AHRQ is an agency of the U.S. Department of Health and Human Services and has taken a reasonably thorough and unbiased review of the literature on the cost of these conditions and so their estimates are likely to be at least as accurate as anyone else’s. The findings are summarized in this table, ranked from most expensive to least expensive. The last cost estimates by the AHRQ was 8 years ago, in 2010 and there has been some fairly substantial changes in the estimates of several of the conditions. Most notably is CAUTI (catheter-associated urinary tract infection) that in 2010 was estimated to incur an additional cost of $1,090 and now is estimated to cost $13,783. Although the cost of most conditions has risen since 2010, the estimated cost of two conditions is now lower than in 2010: the cost of falls is down from $7,888 to $6,694 and the cost of pressure ulcers is down from $18,537 to $14,506. The first step for a hospital is to accurately track all of these hospital-acquired conditions. The challenge is that for some of these conditions, the “official” definitions by agencies such as the Centers for Disease Control (CDC) are often too broad and can result in defining some patients as having a hospital-acquired condition when the physicians who are actually treating the patients know that their condition is not truly a hospital-acquired condition. For example, failure to document a pre-existing pressure ulcer at the time of hospital admission will count as a hospital-acquired pressure ulcer from a reporting standpoint. Improving the metric by better documenting that pre-existing pressure ulcer does not really save any money. Thus improving the metric for public reporting purposes will make the Board of Trustees happy and make the public relations department happy but does not necessarily improve the hospital’s financial margin. 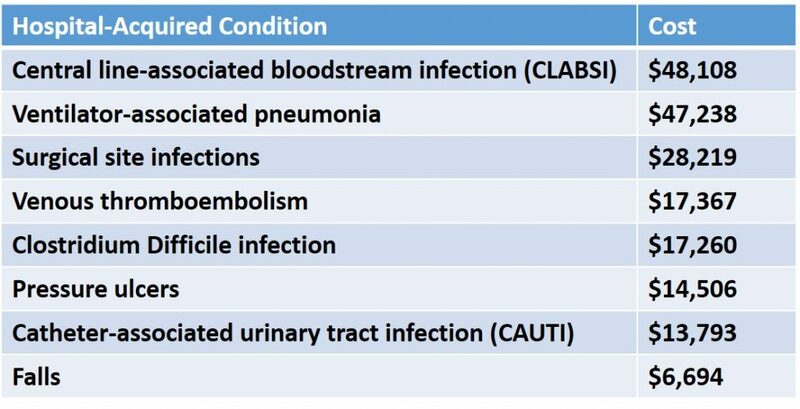 The two most expensive hospital-acquired conditions are ventilator-associated pneumonia and CLABSI (central line-associated blood stream infection). Both of these generally occur in the intensive care units. 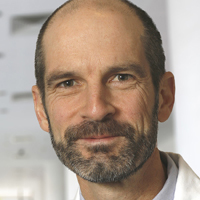 The reasons that these conditions are so expensive is that they significantly increase hospital length of stay (and more specifically/expensively the ICU length of stay), they often result in other complications (such as shock or renal failure), and they cost a lot to treat due to the use of very expensive antibiotics. Simply by reducing 5 cases of these conditions, you can save nearly a quarter of a million dollars a year. Therefore, if the hospital has limited epidemiology resources, it should focus the infection prevention resources on the ICU. Conditions that often happen in a standard medical/surgical nursing unit, such as falls, CAUTIs, and pressure ulcers, are not as costly. As an example, eliminating 3 urinary tract infections saves less money than eliminating 1 central line infection. Reducing hospital-acquired conditions results in “hidden money”. It is money that adds to the hospital’s end of year profit or margin but usually, you don’t realize where it came from. Moreover, the annual hospital capital budget will not reflect these savings. Therefore, in order to show the true value of reducing hospital-acquired conditions, you need a specialized profit and loss statement. Lets take a hypothetical hospital that had 30 Clostridium difficile infections in 2016. They decide to purchase ultraviolet light-emitting sterilizing machines with an anticipation of reducing their C diff infections by 40%, or to 18 per year. The total projected savings will be $207,120 per year. They buy 3 UV emitting machines at $100,000 each ($300,000 total initial cost) and then depreciate them over 3 years ($100,000 per year depreciated cost). It takes 1 full-time environmental service worker per day to manage the machines and so to run them 1 shift, 7 days a week, 52 weeks a year, you will need to hire 2 FTE EVS workers at $75,000 (salary + benefits). Therefore the total cost will be $175,000 per year. In the final analysis, you will end up spending $175,000 but you end up saving $32,120 because of the reduction in C diff cases. 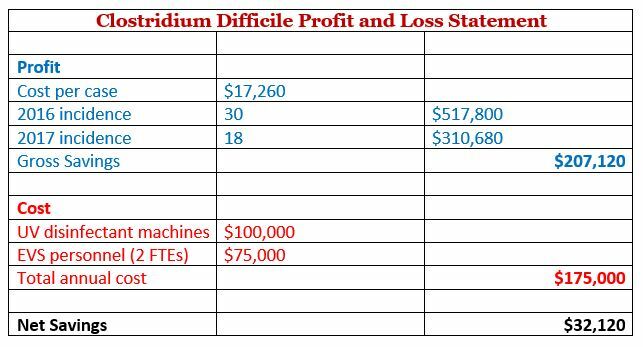 By creating a quality metric-specific profit and loss statement, you can identify which conditions are going to be financially most lucrative to improve. This allows you to prioritize those quality metrics for the purposes of hospital quality scorecards. No matter how hard you try, sick patients develop complications and you cannot always avoid them. If a patient has unrecognized homozygous Factor V Leiden and then comes in for an elective hip surgery, then normal deep venous thrombosis prophylaxis measures are probably not going to prevent that patient from getting a DVT. So, there comes a limit when the incidence of a hospital-acquired condition becomes so low that putting incrementally more money into trying to reduce it further is neither practical nor possible.